In this case, your coffee cup is Troy. What flattering box design. Trader Joe’s 10 Instant Coffee Packets couldn’t look more charmingly mid-century if it was in the center of a Wes Anderson set piece. If only that charm and level of care had extended to the actual coffee packaged inside. What we have here is a classic Trojan Horse situation – only the box is filled with sub-par coffee instead of vengeful Athenians. Final Synopsis Finally, you can have bad coffee anywhere! In theory, this is a pretty good idea. 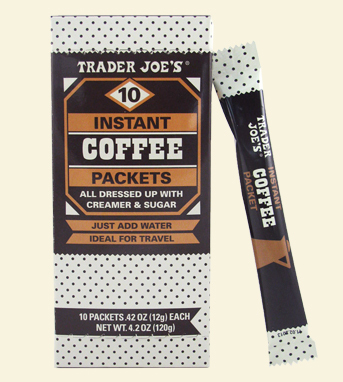 Trader Joe’s cutely states that their packets of instant coffee are “all dressed up with creamer and sugar”- perfect for when you’re on the go, getting on a plane, etc. 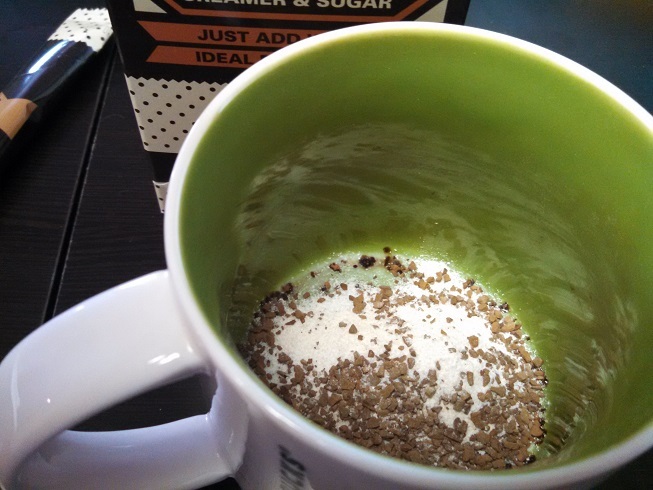 Why not mix the sugar and creamer into the instant coffee right off the bat to let you get on with your hectic schedule? Unfortunately, their execution leaves much to be desired. The problem, it turns out, is two prong. One – this isn’t actual cream we’re talking about, but “creamer” – that ubiquitous white powder passed off in break rooms around the country as a suitable replacement for real cream. It isn’t, of course, isn’t anywhere close. 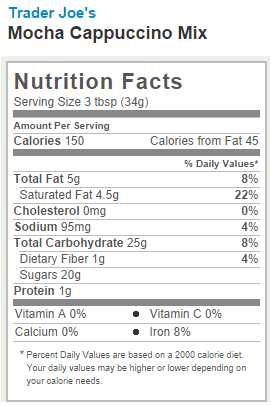 Instead of a dairy product, it’s a combination of corn syrup, oil, whey powder, potassium phosphate and sodium caseinate. You know, all your favorites! And while powdered creamer can get you by in a pinch, it can also comes with a particular aftertaste of something slightly chalky and unsatisfying. Two, and much more problematic, is the powedered coffee itself. 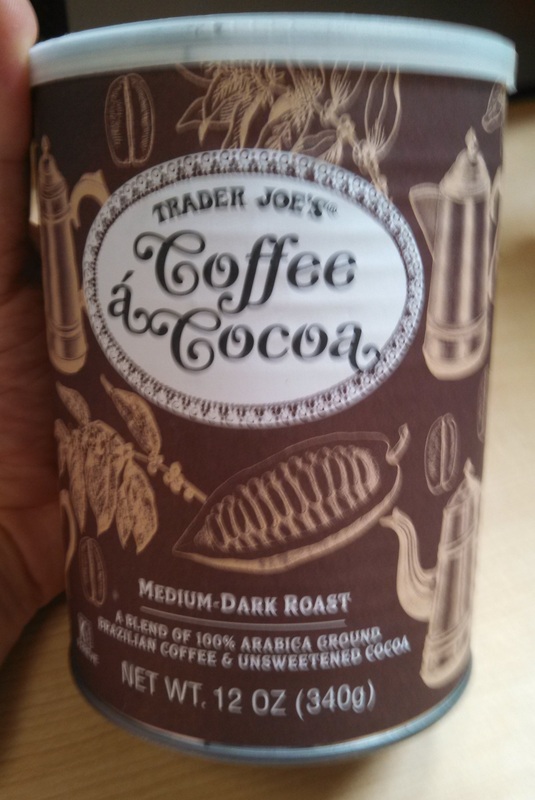 Though Trader Joe’s boasts of the “100% Brazillian Arabica coffee beans” that go into the mix, this is not good coffee. A cup of this stuff comes out not bitter, but sour. While acidity is sought out by many coffee connoisseurs in their good java, it’s usually sought after for lending a “brightness” or “snappiness” to the cup. This is not that. The sour, cheap, aftertaste of the coffee, combined with the already less than great aftertaste of the creamer, makes for a truly unsatisfying cup of coffee. 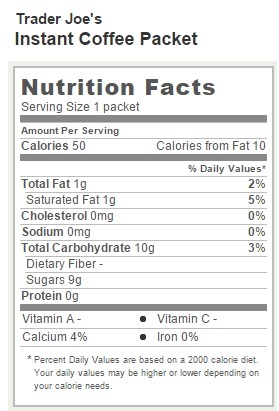 The thing is, sitting right next to me right now I have a little pouch from Starbucks that contains 3 single-serving packets of instant coffee that are not just drinkable, but actually enjoyable. It’s not necessarily coffee to write poetry about, but it is good. Good enough, certainly, to kick Trader Joe’s Instant Coffee Pakcets from here to Timbuktu and back. 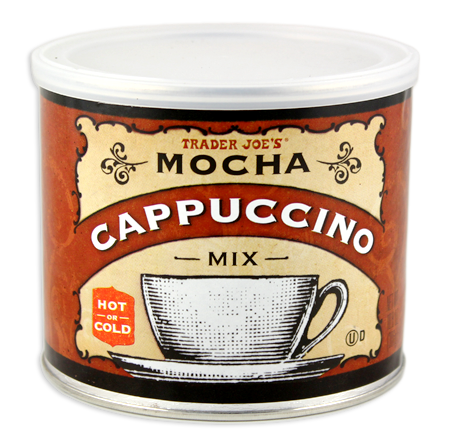 I could be more forgiving if I thought Trader Joe’s didn’t know what good coffee was – but Trader Joe’s does some great coffee. They did their own cold-brew coffee concentrate, for crying out loud, and that was so good it actually made me go back and redact my original snarky post. 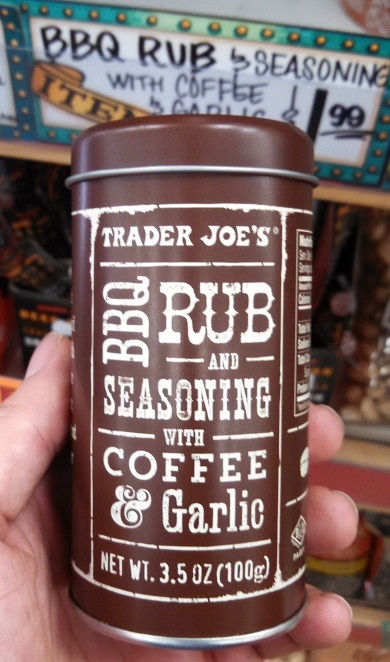 The only thing Trader Joe’s can be proud about here is the original notion of combining creamer and sugar with their instant coffee, and that doesn’t strike me as quite the life-saver they make it out to be. If you really don’t have the time to find the cream for your coffee, then just take it black – know what I mean? I can’t imagine leaving the artificial creamer out of this instant coffee would make it any worse than including it actually does. Long story short – there are way better on-the-go coffee solutions out there. Don’t settle for something gross just because the packaging is cute. A lesson we may apply to our love life as well as our coffee. Would I Recommend It: No, I would not. Pick up one of the Starbucks versions instead. Would I Buy It Again: I’m actually going to throw this box out. Final Synopsis: Finally, a way to experience really bad coffee anywhere!